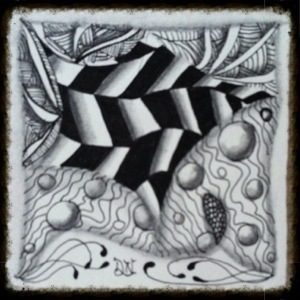 Here I am nearly a month and half later with my next creation from my own goal to create One Zentangle a Day inspired by the book with the same title. Okay, so I will be the first to admit that creating something daily may not always be possible and in my case- probable. So here is my little disclaimer: I will keep posting my tiles as often as I can; sometimes daily, every other day, etc. I do promise I will stay consistent enough not to leave you hanging. That’s fair right? So without further a-do, I introduce my Day Four, Creation Four tile! This tile feature two newly learned tangle “Nipa” and “Jonqual” and a personal favorite of mine “Shattuck”. Hope you “like” this long overdue creation.